Some time ago, I posted photos of the ATCs I made for the Embroidery Association of Canada annual ATC swap. I had forgotten all about it after that so was delighted to open my mail yesterday and find the cards I received in return. Without further ado, here they are! Believe it or not, I think this one was made by one of the Youth Members of Starfish Stitchers in Newfoundland. Her name is Hannah Freake and she needlefelted this gorgeous heart and then embellished it with embroidery and bling. Isn`t it great to see the tradition of embroidery being carried on in youth? 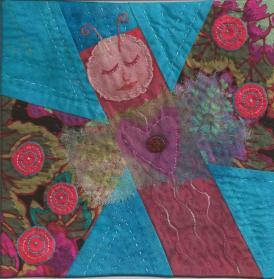 This ATC is entitled "Candlewick Strawberry" and was created by Connie Cook, a member of Norfolks Own Needlearts Guild. I was so happy to receive this and see all the beautiful knots. It kind of ties in with the TAST stitch for this last week although I think they are colonial knots instead of french knots. Either way it is a great example of what can be done with this stitch. "Shimmery Snowflakes" was stitched by Carol Storie of Saskatchewan. I'm not sure of the technique used but it is very effective! Judy Carter in Ontario used needletatting to create "Tickled Pink" - isn't it lovely? The buttonhole stitch around the edge is a treat until itself - so perfectly uniform and well done. Of course, I love tatting so it is a given that I love this one! 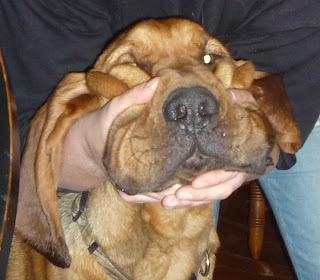 This little cutie was made by Mrs. Ingrid Shellnutt of Hammond Plains, Nova Scotia. Isn't it just the cutest thing? It makes me want to break out some supplies and start making cards for next Easter! Vicki Jericho of New South Wales, Australia, created a third series of Teapot ATCs and I was fortunate enough to receive this one. Lovely! Marie Warren of Newfoundland created this ATC using embroidery, sequins and beads. The buttonhole stitch around the edge is done in metallic braid and it has a bling factor I really like. Last, but certainly not least, is "Sunbonnet Sue, done in redwork by Kathy Taylor of British Columbia, Canada. You NEED to enlarge this one by clicking on the photo to see the detail. The stitching on here must be done by fairies! I have never seen such perfect, tiny stitches. Even with my glasses on I have trouble seeing the individual stitches! A heartfelt to all these ladies for their lovely creations! 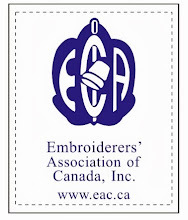 This is just one of the happenings at EAC (Embroidery Association of Canada) that makes it such a treat to be a member! 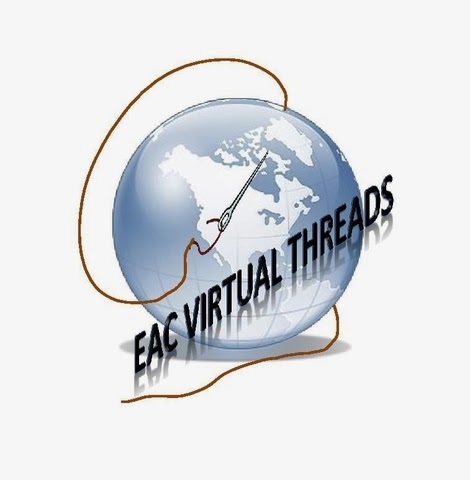 Here is the stitch I have chosen for this Build a Seam (BAS) Challenge. 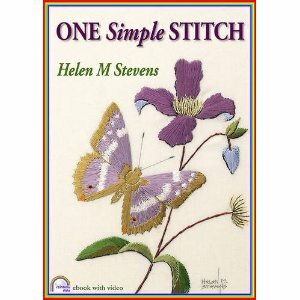 I was browsing through some old embroidery books and came across a whole series of faggoting stitches. If you aren't familiar with faggoting, it is the term given to joining two pieces of fabric by means of an insertion stitch. In this case though, I decided to use this particular stitch, a triple buttonhole stitch which switches back and forth across the gap between the fabrics, as a means to couch down a gold cord instead. You can read more about Faggoting at Victorian Embroidery and Crafts. You will find more about the history of faggoting as well as a variety of stitches with very good diagrams. So, the challenge this time around is to adapt a faggoting stitch to use it for couching instead, either this stitch or another one. Have fun! Well, no stitching this weekend yet and now my hands are so sore I don't know if I will be able to do any - BUT I haven't been idle! I put on my Ms. Handyman outfit first thing Saturday morning and replaced this nasty old thermostat. Much better, right? And this one even seems to work properly. Of course I still managed to add something else to my list since the old one had mercury in it so I have to find somewhere safe to dispose of it in a suitable manner. One thing off the to-do list and another added on.... story of my life! Here is dd and Dex puckering up for a kiss! You gotta love them, right? Isn't this a face only a mother could love? 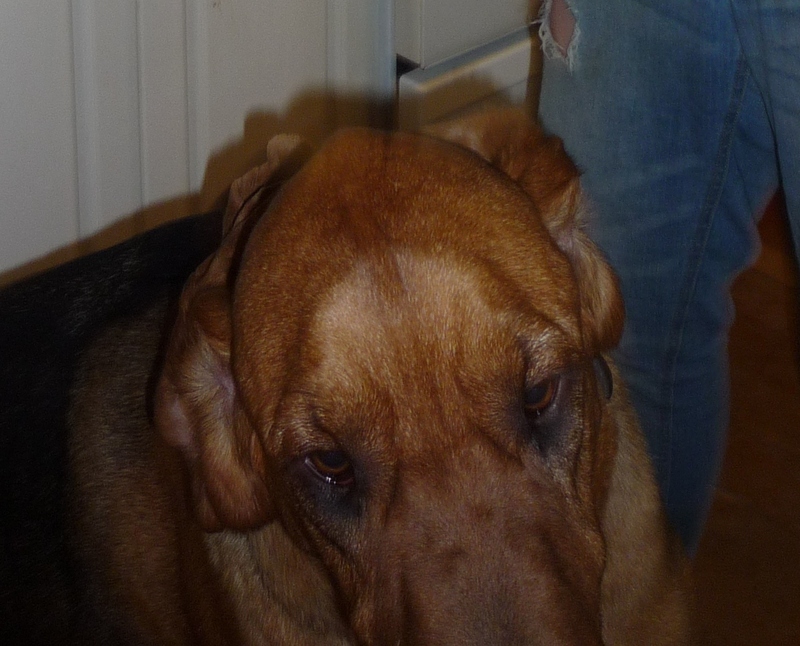 Do your ears hang low? Do they wobble to and fro? Can you tie them in a knot? YES!! The project started with dd buying six tonnes of sand, wheelbarrowing it over to the dog pen and spreading it out. She rented a plate tamper and tamped down all the sand next. Gary and I went out and brought home 800+ patio stones. DH and DD did the laying and I was in charge of bringing the stones over with the wheelbarrow. Me! Well, two pallets of patio stones and who knows how many wheelbarrow trips later - it is almost done! It has to be finished today so Dexter can go outside tomorrow when everyone goes to work. This is the other project we dragged dh away from so he could help us with the dog kennel. A neighbour had a 20 X 30 foot shed they didn't need anymore and were going to tear down. Well, my husband never meet a shed he didn't like so he spent last weekend dismantling it and dragging it home and now he is reassembling it at our house as a wood shed. Obviously, I am happy to say I am feeling better again and have just about kicked the broncitis. Now I am just tired and sore from a massive work weekend! If I don't fall asleep in front of the tv I will have a new BAS stitch for you in the morning. Til then! Giveaway Winners - Contact Me Please! First off, Suzie in Idaho - please contact me with your mailing information or I will draw another name. Thank you! Secondly, the winner of the last giveaway for Making More Beaded Jewelry is Mosaic Magpie! Contact me and I will get this out to you! Suzie, I do not have your mailing information, so could you please get back to me with that and I will send these goodies out to you. Thanks! Wishing everyone a very Happy Easter and that you will have a smile on your face all day, like the one I got when I saw the cupcakes my daughter, Katie, made for us! AAQI Receives Donated Quilt #10,000! Kristin’s quilt measures 8.5″ x 8.5″ and was made with linen, cotton, and silk fabrics. It is machine pieced, hand appliqued, hand embroidered, and hand quilted. Her original design was inspired by a class she took with Jude Hill. Kristin has made 16 quilts for her $1,000 Promise, raising more than $800 for the Alzheimer’s Art Quilt Initiative. She is also a member of the AAQI’s Quilt-A-Month Club having made or purchased at least one quilt every month for the past 14 months in a row. The Alzheimer’s Art Quilt Initiative is thrilled to have reached this milestone and congratulates Kristin and every quilter who support our efforts. The Alzheimer’s Art Quilt Initiative has raised more than $713,000 for Alzheimer’s research, much of this money through the sale of quilts like Kristin’s. Quilts are offered in monthly online auctions, sold outright on the AAQI website, and sold at International Quilt Festival in Houston. 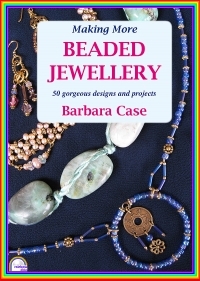 Here is another Rainbow Disk book on disk - Making More Beaded Jewellery. There are 50 projects in this one - enough so everyone will find something they would like to make. You can read all the details on the Rainbow Disks website here. This giveaway is the same as the others - you have to write a review of the disk after you have won it and had a chance to look at it please. You can have one entry for telling me your favourite type of bead and another for telling me you are a follower. You have until Wednesday, April 11th, to enter this one. I asked in the last giveaway for people to guess why I was doing all the giveaways. Well, there were some good guesses and they were all right to some degree. I am de-stashing, I had extras of these disks, I passed the 200 followers mark, etc. Mostly though it is because I have been down and out with a rotten virus and broncitus so haven't felt like stitching and had nothing to post about as a result! lol I hate to not be yakking away here so I thought giveaways were a good answer. Stay tuned - there are more coming. Congratulations Deb (Mosiac Magpie)! According to True Random Number Generator, yours was the winning comment so Creative Fabric Techniques is on its way to you! My last giveaway is still open if you would like to enter - this is a sample of what is in the lace package I am giving away and you can enter by scrolling down to the bottom of the post here. You have until Sunday midnight (Mountain Standard Time) to enter. I will be announcing my next giveaway later today - stay tuned! I am going through my daughter's long abandoned stamp collection and deciding what to do with it. If you have read my blog for awhile you may remember that I take part in a nativity scene display every year at one of the local churches. They have hundreds of creches on display and I always go because it officially puts me in the Christmas spirit at about the right time in November. I get a kick out of having my own creches in the display and I try to add something new every year. All of this group of stamps are Christmas themed and feature nativities so I thought I would do something with them. Easy-peasy! I arranged them in a frame which I picked up for a couple bucks at the thrift store and again have hit two birds with one stone. I have my addition for next year's nativity display in town and I managed to use a few of the stamps from my daughter's old collection. Winner of 1st Giveway & A New Giveaway! The winner of my first giveaway is Linda M (Quayceetatter)! Congratulations Linda! I have sent you an email and as soon as I get your mailing information from you I will have this off in the mail. Thank you to everyone for entering! 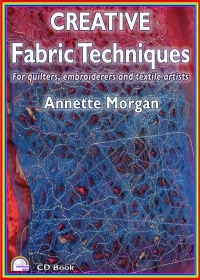 Just a reminder that you still have until Wednesday to enter this giveaway for Creative Fabric Techniques! Scroll down and you will find the post where you can enter for that giveaway. And now for the new Giveaway! This one is for a lace package and there are three bits and pieces up for grabs, all for a single winner. First off there is a vintage embroidered doilie, some venise lace motifs, a battenburg lace doilie and a large crochet doilie. All of these will be great for use in crazy quilting or maybe making that boho bag you have been thinking of constructing! The second item is a lace panel with hanger. This is a new item which would make a lovely gift for someone. All you have to do is remove the demo photos and use the sticky bits that are included to add three photos of your choice instead. How is this for an easy gift to stash away for next Christmas?! The writing on it says "FAMILY is a gift from God". The last part of this package is three pattern booklets from 1961, 1972 and 1974 respectively. Don't you wish prices for patterns was the same now?! lol These cover crochet, tatting, hairpin lace and knitting patterns for doilies and edgings. If you don't do any of these techniques, you can always use the covers and pages in some type of mixed media project! This one is simple to enter - one comment gets you the first entry - tell me if you can guess why I am doing all the giveaways - and one comment telling me you are a follower gets you the second entry. I will draw a name for this one next Sunday - April 8th.